This article recounts the deficiencies of constitutional law and common tenure contract language - the latter based on the 1940 Statement of Principles of the American Association of University Professors - in protecting the academic freedom of faculty on the modern university campus. The article proposes an Interpretation of that common language, accompanied by Illustrations, aiming to describe the penumbras of academic freedom - faculty rights and responsibilities that surround and emanate from the three traditional pillars of teaching, research, and service - that are within the scope of the tenure contract but not explicitly described by it, and therefore too readily subject to neglectful interpretation. This proposal means thus to provide more comprehensive protection for academic freedom at a time when the constitutional concept is near defunct, and thus more broadly to realize, through proper understanding of the written tenure contract, the ideal of the university as the quintessential marketplace of ideas. Originally published in The Journal of College and University Law in 2010. 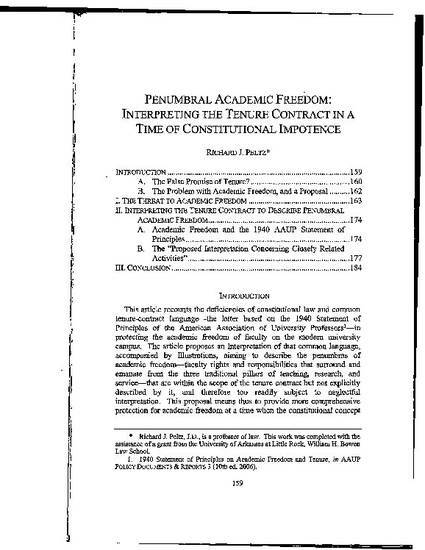 Richard J. Peltz, Penumbral Academic Freedom: Interpreting the Tenure Contract in a Time of Constitutional Impotence, 37 J.C. & U.L. 159 (2010).